Yes, I haven’t updated in over a month. Bad girl, no biscuit. Been doing a few things, and will post about it soon, I promise. However, what I wanted to share today is sort of time sensitive. 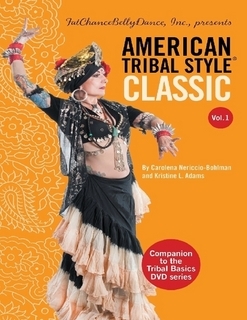 Carolena Nericcio-Bohlman and Kristine L. Adams have finally released the first volume of their American Tribal Style series books. And luckily, they’ve embraced the new formats, so it is available as an epub, and as print-on-demand, which means that the shipping charges are *reasonable*. So far so good, but what’s the hurry? Well, if you’ve got an account with Lulu (the publisher), they’ve released 20% discount coupons earlier today, which means you can get the book with a considerable discount, and yes, this is valid for the e-book version too. The e-book version is not only economical, but also, at least for me, easier to access and take along… I could have a copy on my phone when going to class in case there are questions. I could read it on the train, and I won’t need to worry about carrying around a heavy book, or reading in bed until it falls on my head. Lulu sells it as an epub, but if you use the popular Amazon Kindle, it can be converted using programs like Calibre. Kindle’s MOBI format doesn’t allow for colour images, and there’s plenty in the book, but you’ll still see them in greyscale, so the e-book is a great choice. Will this book “teach” you ATS? No. This book was obviously planned as a companion to each of the ATS DVD volumes (they are now on #9) and should go as a companion either for regular classes or DVD training. By all means, get it if you want to take a closer look at what it is about, but don’t expect just this to be usable as your sole “teacher”. Some things you can sort of figure out, but some, like the Lotus Hand, hardly make any sense through a written description. The *one* downside I can see is that the book is disappointingly short, coming just at 49 pages, and covering just *some* of the foundation steps that are covered on a 6-week ATS course. The printed book lists 68 pages, which is 18 more than the e-book, but I won’t have access to a printed version for a while to compare, so for the time being, my comment about the length stands. Most glaring omissions are the Circle Step and Hand Floreos, and there doesn’t seem to be any word on zills or formations. So basically they’ve stuck to what is covered in the original Vol.1 DVD. To be honest with you, more ground is covered in Carolena’s earlier book, The Art of Belly Dance, but it has now been out of print for quite a while, and fetching ridiculous prices, so this is a good alternative. Personally, I wish the book covered the “Classic” ATS taught in Levels 1-2, with far more information, regardless of how the DVDs are organised, but I understand why they decided to organise things this way. you will be much better served heading towards a class to have a teacher guide you.